UTJ MK Yisrael Eichler submits motion to prevent 'abuse' of strikes in essential professions after latest Egged strike strands thousands. The two-day Egged Ta'avurah strike Sunday and Monday has left tens of thousands of people stranded, from Jewish residents of Judea-Samaria looking to travel to Jerusalem for work to residents of Ashdod left scrambling both within and without of their city. Due to the chaos, MK Yisrael Eichler (United Torah Judaism) has filed a bill Sunday limiting the ability for public transport workers to strike. "The law would restrict the abuse of strikes in essential services like public transport," Eichler stated. 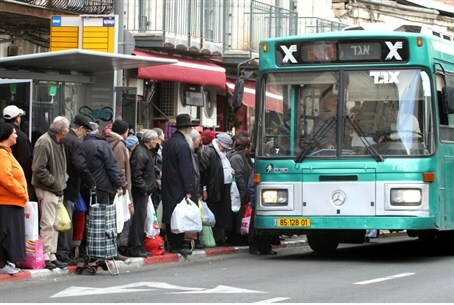 "The haredi public depends on public transport more than any other sector and and will not agree to be a victim of the conflict between bus drivers and financial management." A full list of current Egged Taavurah lines in English, and their stops, is available here. The bus company, which is separate from main transport company Egged, has staged strikes or threatened to stage strikes multiple times over the past year, citing poor working conditions. The current strike is due to an impasse between the employees' union and company management over wages.